As a physician, you know how important preventive care and early detection is for your patients’ physical health. You likely use these terms so often that they begin to feel clichéd. Still, the truth remains: Health problems are best prevented, and if they can’t be prevented, they should be caught early. This principle applies to dental care as well. In recent years, research has uncovered a deepening link to regular dental hygiene checkups and good physical health. • Candida lesions may go unseen inside the mouth and are a possible sign of HIV infection or TB. • Chronic dry mouth is symptomatic of several autoimmune disorders, including Sjogren’s syndrome. • Certain oral pigmentations can be indicative of sarcoma, Addison’s disease or cystic fibrosis. A dentist may be more familiar with these symptoms and may refer the patient to a specialist for followup. The correlation between good oral hygiene and cardiovascular health is becoming better established in the medical community. • There are indications that endocarditis, an infection of the inner lining of the heart, may be caused by poor oral health. Bacteria may enter the bloodstream through unhealthy gums and attach to damaged heart tissue, leading to infection. • Other research links poor oral health to the incidence of heart attack. Several species of bacteria that cause periodontitis have been found in atherosclerotic plaque of the heart and arteries. • Still other studies have found that bacteria from inflamed gum tissue of pregnant women can get into the bloodstream and target the fetus, and may lead to premature labor and low-birth-weight babies. Clearly, there is strong evidence that regular dental checkups are a necessary part of good overall health. With quality dental insurance coverage through the TMA Insurance Trust sponsored plan, preventive dental care, including cleanings, is covered 100%. Having quality dental insurance just makes sense. In addition, the plan offers superior dental coverage at a highly competitive rate for Texas physicians. Would you like to learn more? Contact us to speak with an agent who can answer your questions and provide you with a personalized quote. 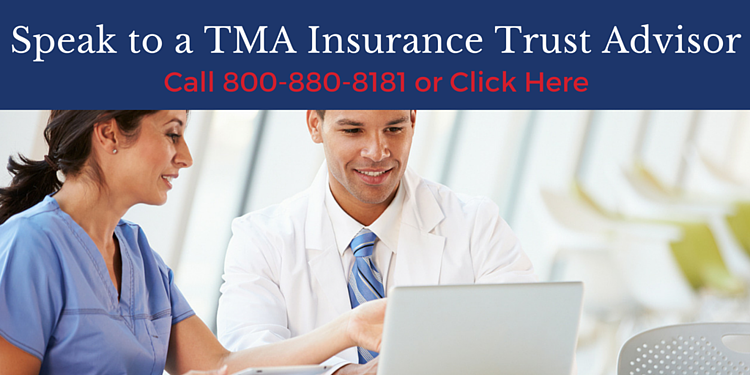 For over 60 years, TMA Insurance Trust advisors have been serving Texas physicians and their families. Our goal is help you choose affordable, comprehensive dental and vision coverage that exceeds your expectations, while meeting the unique needs of your family and your practice. As a member, you also have access to a 24/7 support hotline from our provider for questions about plans and benefits. Want to speak to an advisor, complete the form below and we will reach out shortly.